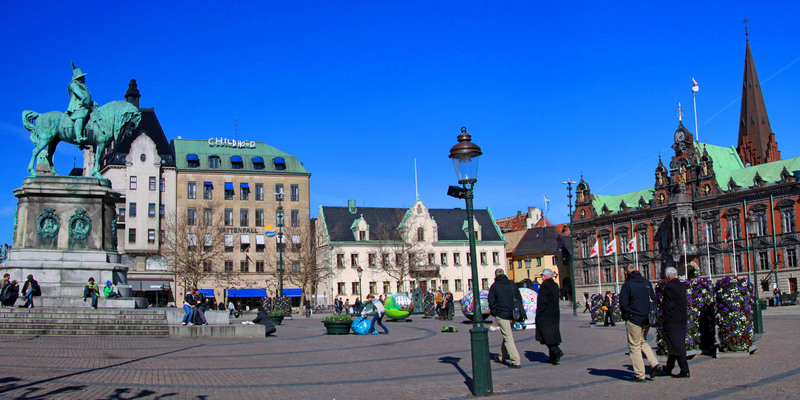 The Stortorget created in 1540 is with 2,500 square meters the largest and also the oldest square in Malmö. 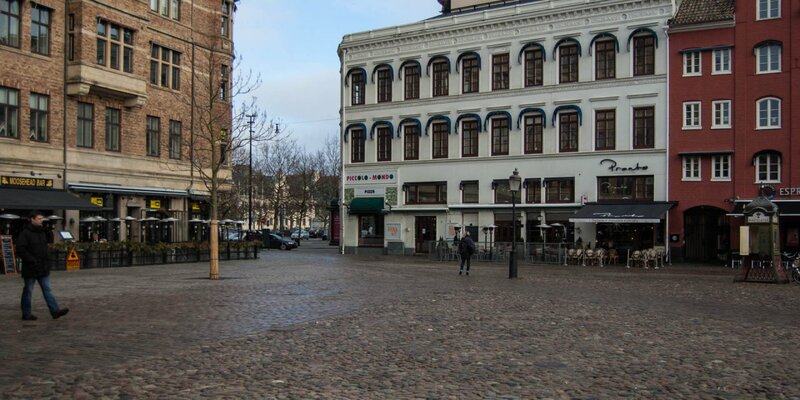 Originally it was the largest market square in Northern Europe and is now willingly and often used for big events, such as during the Malmö festival. At Stortorget's center stands the great equestrian statue of King Karl X Gustav, who had conquered the former Danish provinces of Skåne, Blekinge and Halland and finally had united them with the Swedish Empire by the Peace of Roskilde in 1658. The square is surrounded by some interesting historical buildings. On its eastern side stands the historical town hall, built 1544–1547 with its renewed façade in Dutch Renaissance style from 1860. The northwest corner of the square is dominated by the Kocksa Huset, the former palace of the native-born Westphalian Jörgen Kock, built 1522–24. Kock was master of the mint and once a powerful men of the Danish Empire and became Mayor of Malmö later. The headquarters of the provincial government of Skåne län at the southside of the Stortorget was built in the 16th century. 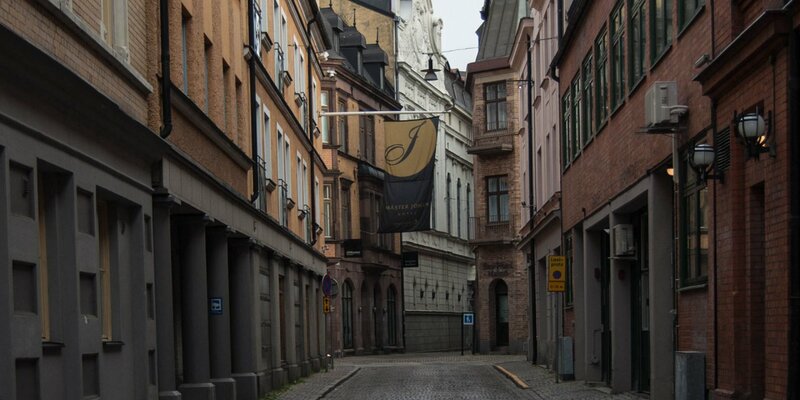 The oldest pharmacy Lejonet (The Lion), founded in 1571, is located at the exit of the square to Södergatan. The current building was erected in neo-Renaissance style in 1896. Worth seeing is the fire gable of this 5-storey building, probably as the only building in Europe with fully restored advertising paintings from the period around 1900. Just steps from Stortorget away is the small and cozy Lilla Torg, also surrounded by beautiful old buildings. Lilla Torg was created around 1590 because Malmö market had become so great, that the space on the Stortorget was no longer sufficient. The emergence of Stortorget goes back to the initiative of the mayor Jörgen Kock. First the Catholic church including the associated monastery were demolished because after the Reformation they were no longer needed. After completion of Stortorget, the plan for building the town hall were also immediately started. 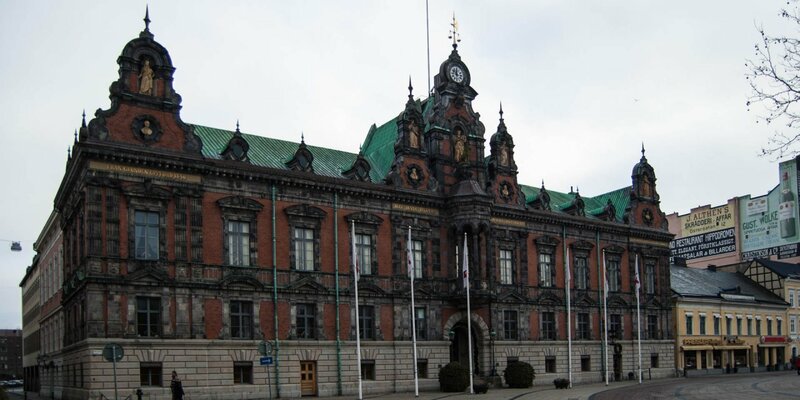 After the construction of the town hall, the medieval Malmö had both, the largest market place as well as the largest city hall in Northern Europe and underscored its importance as a major trading center. Close to the today's ornamental fountain was the central city fountain which was in use from the time of origin of Stortorget until the end of the 19th century. In a powerful solution for this time many buildings in the city were supplied with drinking water through wooden pipes from this fountain. After the great cholera epidemic in 1850 it was discovered that the wooden pipes were breeding grounds for germs and therefore altered the water distribution with metal pipes. A short time later the water supply was carried out from the water tower and the ponds in Pildammsparken so that the central city fountain was closed.